Newmarket Gold's shares have appreciated 75% since the beginning of 2016, but CEO Douglas Forster believes that is just the beginning. The company's storied founders have set their sights on making Newmarket the next high-quality mid-tier gold producer. In this interview with The Gold Report, Forster puts forth his vision of how, starting with the acquisition of Crocodile Gold, he will make that happen. The Gold Report: Newmarket Gold Inc. (NMI:TSX) has a significant, well-known team with a strong track record. What brought all of you together? Doug Forster: The founders of Newmarket Gold are friends. We decided it would be great to work together on a mining opportunity. After gold dropped about $100/ounce ($100/oz) one day in April 2013, we agreed that we had not seen valuations for gold assets at this level for many years. So we decided Newmarket would acquire gold-producing opportunities, and our strategy would be to roll up quality gold production assets. Great gold assets don't walk through the door. You have to literally dig them up. So having Lukas Lundin, Randall Oliphant, Ray Threlkeld and Blayne Johnson as founders of Newmarket brings an incredible contact base and scope of relationships to our business, which we will leverage to find and acquire those undervalued, potentially unrecognized quality gold assets. Newmarket wants to be the next quality mid-tier gold producer. Our first acquisition, Crocodile Gold Corp., was an unrecognized, undervalued gold production opportunity that our team identified, negotiated terms and closed. It has worked out very well for our shareholders. Bringing this team together was the seed of the success that we're now reaping for our shareholders. TGR: Nothing shows more belief in a company than investing one's own money. Can you share management's ownership percentages and how much they've invested to date? DF: The founders and management of Newmarket own about 8% of the company, and we have collectively invested CA$12 million (CA$12M) of our money. It's tremendously important that management and founders of public mining companies invest their own capital alongside shareholders. When we closed our first acquisition in July 2015, we completed a CA$25M concurrent financing at CA$1.25/share. The founders of Newmarket invested CA$9M, or 36%, of that financing, and this attracted other investors to join us in making Newmarket an outstanding success. TGR: You have a unique performance share unit (PSU) investing plan and lower-than-average general and administrative expenses (G&A) that are aligned with your shareholders. Can you explain? DF: Our PSU plan is unique in that the PSUs are not time-based vesting. Rather, they vest according to certain share price hurdles. We have aligned our incentive programs with what is most important to shareholders: share appreciation. There are approximately 4.0M PSUs granted to the management, board members and founders. The first one-third tranche vests when our share price hits $2.25 on a 20-day, volume-weighted average basis. The second tranche vests when the shares hit $3, and the third tranche is vested at $3.75. In this way management and founders' incentive are directly aligned with shareholders. Our G&A is about $27 per annual ounce of production, and that's about half of our junior producer peer group, which averages approximately $56/oz of annual ounce of production. TGR: Newmarket Gold launched on a significant acquisition in May 2015, lifting the company to a 200,000+ ounce (200+ Koz) per year gold producer. Would you tell us about that? DF: We had been following the progress of Crocodile Gold and its three producing gold mines in Australia. We watched its production stabilize above 200 Koz per year, and we also watched its operating cost decline approximately 40% over three years. The barrier to acquiring Crocodile Gold for anyone, let alone Newmarket, was a free cash flow sharing deal that was in place with AuRico Gold Inc. In January 2015, Crocodile renegotiated the deal with AuRico, and this made Crocodile a high priority acquisition opportunity for Newmarket. The other bonus to negotiating the deal was the fact that one shareholder, Luxor Capital Group, owned 56% of the outstanding shares of Crocodile Gold. So we really had just the one shareholder to deal with in negotiating the deal with Luxor and with the Crocodile board of directors. TGR: Jurisdiction is very important to most investors out there. Can you explain your jurisdictional choice in Australia, considering you're a Toronto Stock Exchange (TSX)-listed company? DF: You go where the gold is. Australia is the second largest gold-producing jurisdiction in the world, behind China. Australia is also a stable mining jurisdiction with a long track record and history. Security of mining tenure is really an important factor in choosing jurisdiction to invest our capital and the capital of our shareholders. The weak Australian dollar is also a great benefit for our production cost profile, and this is an added benefit for being a gold producer with all of our production located in Australia. I believe Australia is one of the safest, most cost-effective and prospective gold mining jurisdictions in the world. Newmarket inherited the TSX listing when we purchased Crocodile Gold. I have spent a ton of time in Australia and we have contemplated listing our shares on the Australian Stock Exchange (ASX). 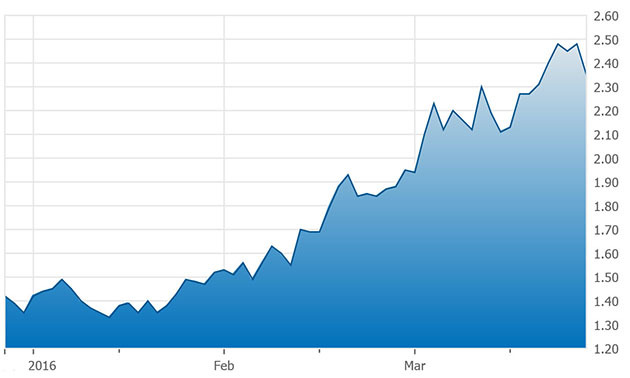 It's truly a bull market for gold stocks on the ASX Exchange. We may consider an ASX listing in the future. If the opportunity came available, it would likely come through an acquisition of a gold producer in Australia, where we would inherit the listing and their shareholder distribution. TGR: Newmarket did a significant amount of drilling in H2/15. Can you tell us about the drilling and how it benefited Newmarket? DF: In 2015, we completed approximately 42,000 meters (42,000m) of drilling in almost 200 drill holes, focused on the Phoenix and Lower Phoenix gold system at the Fosterville mine, our flagship asset. We invested a total of US$12M across our operations on growth exploration and development. That has really led to a number of significant discoveries at our Fosterville operation, including the high-grade, visible, gold-bearing Eagle Fault and East Dipper zones. This drilling has increased our gold reserves at our Fosterville gold mine by 34% from last year to 244,000 ounces and our reserve grade by 25% to 6.95 grams per ton (6.95 g/t). We just tabled the new Measured and Indicated (M&I) Mineral Resource for our current mining front in the Phoenix and Lower Phoenix gold system at our Fosterville operation, which contains 673 Koz grading 8.33 g/t gold. Mill grade during 2015 at Fosterville averaged 6.11 g/t, so we have seen a significant increase in our reserve and resource grade from last year's average grades. Our new discoveries during H2/15 have significantly increased the grade of our gold resources. This M&I resource base has the potential to significantly extend the reserve life of our Fosterville mine, so it's been money well spent. In addition to Fosterville, we also have been working at our Stawell mine. Our investment in growth in 2015 led to the discovery of the new Aurora B gold zone. We've published a maiden Inferred Mineral Resource for Aurora B, a discovery of 30.4 Koz grading 3.5 g/t gold. This initial grade of the Aurora B discovery is 42% greater than the current Stawell underground reserve grade, which is 2.47 g/t gold. Australia is one of the safest, most cost effective and prospective gold mining jurisdictions in the world. There is excellent potential for expanding the Aurora B discovery through additional drill programs, which are now underway. We've made a big investment through drilling at our Fosterville, Stawell and Cosmo mines, and it's paid off significantly in reserve and resource increases, as well as new discoveries. TGR: You have a few other development-phase gold assets that could potentially add to the organic growth of the company. Do you want to elaborate? DF: Our Big Hill project located at our Stawell mine is the open-pit expression of the Stawell underground ore body that's been mined continuously for 30 years. A feasibility study has been tabled that envisages open-pit mining of the oxide deposit that hosts an M&I Mineral Resource of 166 Koz grading 1.52 g/t gold. The Stawell mine is located adjacent to the Big Hill deposit, so capital and development costs will be very low. The proposed mine development is currently under review by regulators in Victoria, and we're waiting for a decision on development. As the project is subject to receiving these permits, we don't currently have it in our Stawell mine plan, but we'd certainly like to extract that oxide ore and put it through the Stawell mill since the mill is right next to the deposit. The second development project is the Maud Creek deposit in the Northern Territory, which hosts an M&I Mineral Resource of 724 Koz grading 3.46 g/t gold. We're currently completing a preliminary economic assessment (PEA) on that project. The PEA will have two development options, a stand-alone operation and an option using our Union Reefs (UR) mill. Our UR mill currently has 1.2 million tons of excess milling capacity, so it makes sense to see if we can utilize this excess capacity for processing Maud Creek ore. The Maud Creek project is located about 110 kilometers from the Union Reefs mill, which is currently processing ore from our Cosmo mine. That PEA for Maud Creek will be published early in Q2/16. TGR: We noticed that you have strengthened your balance sheet by redeeming your convertible debentures, leaving you essentially debt-free. Do you anticipate growing your cash reserves? DF: By the end of March 2016, we'll be essentially debt-free with the conversion of our $34M convertible debenture into Newmarket common shares. A strong balance sheet is important, especially when we're experiencing volatile gold prices. Not many producing gold companies have unhedged production, essentially no debt, only 175M shares issued and outstanding, and approximately US$36M in cash. We're a real standout in all of those categories. Free cash flow and growing our cash reserves really are very important to Newmarket. We will continue to focus on maintaining and growing our production profile and decreasing our operating costs while generating free cash flow. The money saved on not paying the interest on that debenture will be of good use to Newmarket as we advance our new discoveries. TGR: What is your strategy for 2016? DF: Given that we no longer have that debt to service, we intend to invest US$5–10M in our growth discoveries across our operations during 2016. We have plans to advance our Eagle and East Dipper discoveries at our Fosterville gold mine, our Aurora B discovery at our Stawell operation and our Western Lodes discovery at our Cosmo mine in the Northern Territory. Our shares have increased approximately 75% since the start of 2016, but we really think that we can do much better. If you look at any valuation metrics—price/cash flow or price/net asset value or enterprise value per ounce of annual gold production—we're still significantly undervalued with respect to our gold producer peer group. We are very focused on creating shareholder value. 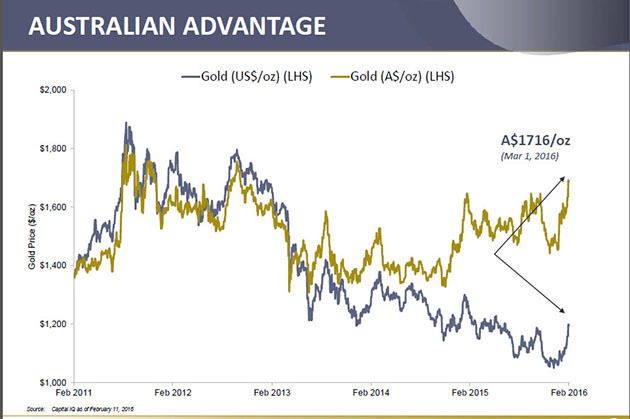 Given the weak Australian dollar and low-cost profile, the Australian-listed gold producers are trading at their all-time highs at valuations that are well in excess of Newmarket Gold. That valuation gap between Newmarket and our peer group is our challenge and our shareholders' opportunity. To move forward, given the grade increases at our flagship Fosterville mine, the discovery of the Aurora B zone and our Stawell operation, we really see the potential for organically growing our production. Organic ounces really are the most cost-effective production ounces, and these ounces can really increase our market valuation. Ultimately, Newmarket wants to be the next quality mid-tier gold producer. We'll achieve this by acquiring additional gold production opportunities in Australia and North America. For us, being a mid-tier gold producer is approximately 400–500 Koz annual gold production so we are halfway there. Given the prospects of our organic growth and our acquisition strategy, we are very focused on creating shareholder value moving forward. TGR: Do you have any final thoughts? DF: Newmarket has only been a public company with our three producing gold mines in Australia for approximately eight months. We feel we are only just starting to create value for our shareholders. With sustainable gold production of over 200 Koz, a decreasing cost profile and both an organic and an acquisition-based strategy for growth, we believe the future for Newmarket and our shareholders is very bright. I would like to thank our 800 Newmarket employees and contractors because it is through their dedication and operational excellence that we've been able to lead Newmarket on the path to success for both our employees, and of course, all of our shareholders. Douglas Forster is the president and CEO of Newmarket Gold Inc. He has been associated with the mining industry for over 30 years as a geologist, senior executive, director and company founder. Forster has been involved in a number of large-scale Canadian mine development projects including the Mt. Milligan gold-copper mine, the Kemess South gold-copper mine, the Golden Bear gold mine and the Legacy potash project. He holds a Bachelor of Science and Master of Science in economic geology from the University of British Columbia, Canada. 1) Paul Guedes conducted this interview for Streetwise Reports LLC. He owns, or his family owns, shares of the company mentioned in this interview: None. 2) Newmarket Gold Inc. is a sponsor of Streetwise Reports. 3) Douglas Forster had final approval of the content and is wholly responsible for the validity of the statements. Opinions expressed are the opinions of Mr. Forster and not of Streetwise Reports or its officers. Graphics courtesy of Newmarket Gold.